Ever wonder how Nike became the athletics empire it is today? From an Idea to Nike digs into the marketing campaigns and strategy that turned this running-shoe company into the outfitter for many athletes as well as the iconic American brand. 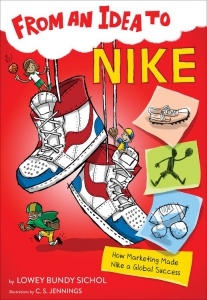 With infographics and engaging visuals throughout, this behind-the-scenes look into the historical and business side of Nike will be an invaluable resource for kids interested in what makes this business run. Find out where the name Nike came from and how the famous swoosh became the signature logo. Learn about the company's first marketing campaign with a star athlete. (Hint: It wasn’t Michael Jordan!) Explore the ways Nike expanded marketing from running to basketball, soccer, golf, and beyond!